If your chronic health issues all started/worsened after a major traumatic event in your life, you may have some brain chemistry changes similar to those with PTSD, even if you have not officially been diagnosed with it. Understanding PTSD and how these traumas led to your stress responses being stuck on (adrenal fatigue) and natural ways to deal with it might help resolve your health problems. If you have been diagnosed with PTSD, I also cover natural treatments I’ve personally tried for PTSD in this post. Post-traumatic stress disorder (PTSD) is a psychiatric disorder marked by psychological symptoms, such as re-experiencing an event, dysfunctional fear memories, and physical symptoms such as anxiety and increased heart rate [R]. These symptoms usually persist for greater than one month [R]. PTSD develops from experiencing a traumatic event (e.g., a terrorist attack, military combat, natural disaster, etc.) that has a more significant impact than that of daily stressors [R]. PTSD is common among military veterans, with around 20% of combat-exposed soldiers developing and suffering from PTSD [R]. The National Comorbidity Survey Replication has estimated that the lifetime prevalence of PTSD is 9.7% among women and 3.6% among men. More than 60% of the people experience at least one traumatic event in their life [R]. Many people with PTSD also have other psychiatric disorders including major depression and anxiety [R]. Individuals with a PTSD are more likely than the general population to use drugs, experience impairments in psychosocial functioning, and have suicidal behaviors [R]. The adrenaline and noradrenaline receptors stimulate brain activity and sympathetic autonomic responses through the amygdala and hypothalamus, which are responsible for stress and fear [R]. Elevated noradrenaline levels in certain brain regions (prefrontal cortex and hippocampus) following trauma predict PTSD symptoms in mice [R]. Noradrenaline plays a role in the memory encoding of negative events. An imbalance of noradrenaline leads to re-experiencing traumatic memories and maintenance of hyperarousal, both common symptoms of PTSD [R, R]. A study in 44 patients has shown an overabundance of adrenaline and noradrenaline in the urine of patients with PTSD and other mental disorders [R]. Noradrenaline levels were also increased in PTSD patients without other diseases [R]. It is not fully understood why some individuals develop PTSD following trauma while others have no psychiatric effects or experience other disorders such as depression, substance abuse, or somatization. There is evidence that some individuals may be genetically predisposed to the development of PTSD after a traumatic event [R]. Genes that encode adrenoreceptors may play a role in PTSD since substances that interact with α2-adrenoreceptors (like yohimbine) increase their activity leading to fear extinction and increasing anxiety and PTSD symptoms severity. Also, substances that interact with β-adrenoreceptors (like propranolol) inhibit fear memory reconsolidation [R]. The noradrenaline transporter (NET) is a potential noradrenaline target for PTSD treatment. NET availability is reduced in the brain (locus coeruleus) of PTSD patients with an increase in the severity of anxious arousal symptoms [R, R]. The serotonergic (5-HT) receptors are involved in cognition, emotional processing, and behavior [R]. Substances that activate 5-HT can induce anxiety attacks and trauma-related flashbacks in PTSD patients [R]. Fear and threat response have been linked to 5-HT signaling in the amygdala, an area of the brain important in fear and stress responses [R]. A study involving brain scans of 16 patients with PTSD versus 16 healthy volunteers found decreased serotonin receptors in the amygdala [R]. Genetics also play an important role in PTSD caused by serotonin imbalance. Participants who experienced both childhood and adult traumatic events had a higher risk of PTSD if they carried 1 or 2 copies of the S (short) allele for 5-HTTLPR, a common polymorphism (not tested by 23andme), which was found to increase the serotonin transporter SLC6A4 [R]. Substance P is a neuropeptide that plays an important role in response to extreme stressors that could compromise biological integrity. Its receptor, neurokinin 1 (NK1), is located within brain areas involved in stress and anxiety [R]. Increased substance P is involved in both major depression and PTSD. Substance P responds acutely to psychological stress in humans [R]. In addition, the 16 patients with PTSD had increased substance P receptors in the amygdala [R]. The coupling of the serotonin and substance P pathways is important to the propagation of anxiety and fear symptoms in PTSD [R]. In a study of 110 people, elevated blood levels of the excitatory neurotransmitter glutamate were found compared with healthy controls 3 months after experiencing traumatic accidents. Glutamate plays a part in learning and memory pathways in the brain [R]. Overstimulation of neurons in the brain through glutamate can cause a malfunction in learning and memory pathways. Studies showed a positive relationship between the severity of PTSD symptoms and elevated glutamate levels [R]. After a traumatic event, dissociative symptoms predict the development of PTSD. Stress increases glutamate, which in animals influences behavior and induces plasticity of the brain that may have long-lasting effects on brain function and behavior [R]. A recent study suggests that a drug that reduces glutamate also decreases the effects of the NMDA antagonist, ketamine, in humans. Thus, drugs that decrease glutamate might help patients with dissociative symptoms due to PTSD [R]. In a study of 27 PTSD patients suffering from insomnia, researchers found a connection between low levels of the inhibitory neurotransmitter GABA, a molecule that is crucial to preventing the hyperarousal symptoms of PTSD and poor sleep quality [R]. In addition, individuals with lower GABA levels are more vulnerable to developing PTSD after a traumatic incident [R]. Early traumatic experiences increase the risk of PTSD, and GABA deficits are involved in its development. An animal study found that juvenile traumatic stress induced chronic anxiety and spatial memory loss and reduced expression of GABAA receptors, and exercise led to significant improvement [R]. 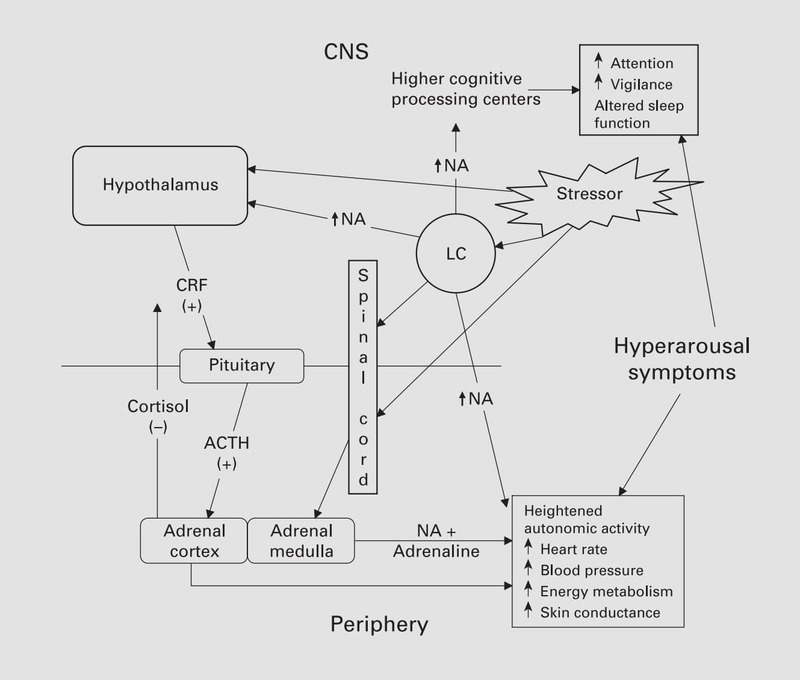 The corticotropin-releasing hormone (CRH) is produced by cells in the hypothalamus in response to physical or psychological stress, which consequently releases cortisol by the hypothalamic-pituitary-adrenal (HPA) axis. A study in 61 veterans, with or without PTSD, showed increased CRH levels in PTSD patients compared to healthy controls [R]. Interestingly, patients have high CRH, lower ACTH, and often low cortisol [R]. In animal studies, the activation of CRH receptors was involved in the initiation and post-trauma consolidation of stress effects on anxiety-like behavior, supporting the use of blockers for these receptors as potential prophylactic treatments for PTSD [R]. PTSD patients exhibit increased levels of CRH, indicating the utility of compounds that dampen the CRH system in the treatment of PTSD [R]. Cannabinoid (CB) receptors (CB1 and CB2) play an important role in PTSD, specifically in stress responses [R]. CB1 receptors are found throughout the brain and modulate a variety of behaviors, including mood, stress, anxiety, learning, memory, and fear [R]. CB1 is found in a brain region responsible for fear that is implicated in PTSD. 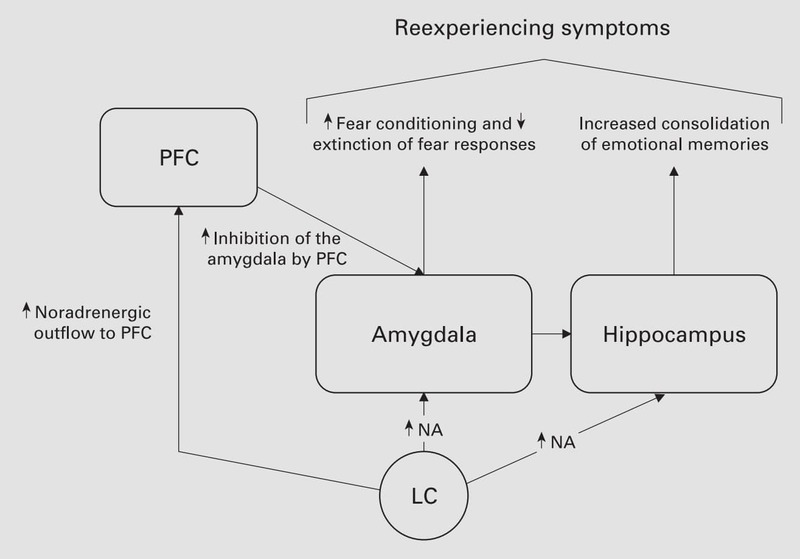 Genetic or pharmacological alterations of CB1 functions, which are required for normal fear extinction, result in anxiety for PTSD patients related to aversive memories [R, R, R]. PTSD may lead to increased alcoholism, and CB1 is sensitive to the effects of alcohol and traumatic stress. An animal study showed that PTSD blunts the behavioral sensitizing effects of alcohol in the brain. Also, mice exposed to stress and alcohol had decreased CB1 in the brain [R]. Opioids are the most widely used and effective painkillers for acute, strong pain. Opioid receptor activation following stress can not only increase pain relief but also affect numerous behaviors including reward and depression [R]. Opioid receptors are located in brain regions that mediate anxiety-like behaviors and are implicated in the causes of PTSD [R]. A wide range of medications have been studied for PTSD and a number are registered for this indication. Nevertheless, current treatments are only partially effective in some patients and are minimally effective in others. Potential new treatments need to and are being investigated, including glutamatergic, noradrenergic, and opioid pathways. Here are the main explored therapeutic options. Selective serotonin reuptake inhibitors (commonly known as SSRIs) allow for increased serotonin levels by preventing the clearing of serotonin from cellular receptors. Serotonin is an important brain molecule in the regulation of mood [R]. In one study (DB-RCT), 208 patients diagnosed with PTSD took either the selective serotonin reuptake inhibitor (sertraline) or a placebo. The patients given sertraline had a significant improvement in their symptoms (60%) over placebo (38%) [R]. However, selective serotonin reuptake inhibitors are not perfect. The drug takes weeks to show a therapeutic effect and has potential side effects, such as a change in appetite and loss of sexual drive [R]. The combinations of naltrexone and either the SSRI, paroxetine, or the NRI, desipramine, were studied in veterans with PTSD and alcohol dependence [R]. Desipramine had a similar effect on PTSD symptoms reduction compared with the standard SSRI treatment and was more effective in reducing alcohol consumption. Naltrexone reduced alcohol craving relative to placebo, without advantages on drinking use outcomes [R]. Tricyclic antidepressants (serotonin-noradrenaline reuptake inhibitors or SNRIs) inhibit the reuptake of the neurotransmitters serotonin and noradrenaline, controlling the biochemical pathways involved in anxiety. Two examples of tricyclic antidepressants are imipramine and amitriptyline [R, R]. However, most tricyclic antidepressants, such as imipramine and amitriptyline, are not specific to a couple of receptors, which allows for many possible side effects. These side effects include blurred vision and constipation [R, R]. Although SSRIs are the only FDA-approved medications for the treatment of PTSD, a study suggested that SNRIs may have advantages when treating male veterans with PTSD [R]. Ketamine is an anesthetic with interesting psychoactive effects. It is a glutamate receptor blocker of the effects of excessive glutamate seen in most cases of PTSD [R]. In a study of 141 military burn victims, the patients who received ketamine had a PTSD prevalence of 26.9% while the others had a PTSD prevalence of 46.4% [R]. However, due to the psychoactive nature of the drug, there could be a worsening of PTSD symptoms if the size and timing of dosages aren’t properly maintained [R]. In multiple studies of accident victims, ketamine increased symptoms of reexperiencing and dissociation. Given the mixed results from ketamine studies, other treatment options should be considered first [R, R]. Mirtazapine is a noradrenergic and specific serotonergic antidepressant (NaSSA) that is approved in many counties for use in the treatment of depression. It is as effective as other antidepressants and may have a more rapid onset of action than selective serotonin reuptake inhibitors (SSRIs) [R]. Mirtazapine may also be effective in the treatment of anxiety disorders (including PTSD) [R]. Animal studies have shown that treatment with hydrocortisone shortly after a traumatic event decreases the likelihood that the patient will suffer from PTSD, in comparison to placebo [R]. PE is considered a gold standard protocol for the treatment of PTSD, which has shown effective in combat veterans [R]. CBT helps patients to question and alter dysfunctional trauma-associated cognitions. In vivo or in sensu confrontation with trauma reminders helps patients to overcome their avoidance of situations and thoughts that are no longer dangerous, which leads to habituation and a reorganization of trauma memories finally [R]. During EMDR, patients mentally focus on a trauma-associated disturbing image, memory, emotion, or cognition. In comparison to CBT, confrontation is rather short and interrupted by saccadic eye movements that are initiated by the therapist [R]. Yoga and other forms of meditation have a natural stress-relieving effect, which could help mitigate the hyperarousal symptoms of PTSD [R]. Chronic PTSD in young adults can be treated with long-term yoga sessions [R]. Multiple studies of people who underwent abusive or neglectful trauma found yoga to be effective in treating the depressive symptoms of the disease [R, R]. Yoga can even help increase resilience from the disease, as a study of military personnel, recently home from deployment, showed decreased PTSD symptoms and increased mindfulness [R]. Cannabidiol (CBD) is a part of the cannabinoid family found in the marijuana plant Cannabis sativa, and, while similar to the compound THC (the active component in medical marijuana), cannabidiol does not produce psychoactive effects [R, R]. The lack of psychoactive elements makes cannabidiol a prospective treatment for PTSD (given PTSD largely psychoactive symptoms). Other psychoactive drugs, such as ketamine, have a much more variable response to the disease [R]. Rats were given cannabidiol after experiencing and interacting with a predator (such as a cat). Repeated administration of cannabidiol after the interaction prevented long-term anxiety effects, which shows promise for PTSD treatment [R]. Neuropeptide Y (NPY) is an important messaging molecule in the brain that helps suppress anxiety caused by increasing cortisol and corticotropin-releasing hormone (CRH), which are stress-response hormones [R]. The blood levels of NPY in soldiers undergoing extremely stressful prisoner of war exercises were higher after the exercises [R]. Soldiers whose NPY level never returned to pre-exercise levels exhibited PTSD symptoms. These soldiers were found to have a depletion of NPY in their blood [R]. Strenuous exercise was found to increase NPY levels, indicating possible anti-anxiety benefits of exercise [R]. Animal studies showed that sexual activity counteracts the negative effects of chronic stress on the synthesis of new adult hippocampal neurons and recognition memory [R]. I’ve had one PTSD-like episode in my life a long time ago. Somehow, that episode caused long-lasting changes in my cognitive function (a few weeks, not permanent). What does it feel like? It feels like a rush of acetylcholine in your hippocampal area and next to it. Your hypothalamus is also affected. I noticed a rush of CRH as well, which is the first part of the stress response. I know what too much acetylcholine feels like because I’ve gone overboard on supplements that increase acetylcholine at least a few times, and it caused cognitive dysfunction. With acute stress, you get a rush of acetylcholine in the amygdala/hippocampus and other affected areas. So the same thing happens, but the regions are slightly different and the rush of acetylcholine isn’t as rapid as PTSD. With PTSD, there’s a massive rush in a period of a minute or so. I had only one episode, but people in war can experience dozens or hundreds of these. Often, only one event is necessary. The physiological effects are manifested in a tight jaw clenching, which is the same effect as if you were to take too many supplements that increase acetylcholine. PTSD also impaired my sleep and lowered my libido dramatically. I was less empathetic, more depressed, less self-aware, and less able to balance/handle my emotions. I also felt general ‘hyperarousal’ and more estrangement from others, which is a symptom of PTSD [R]. PTSD made me less trusting and more on the edge. My senses were more narrowed and I had less metacognition. In 1998, a Nature study showed that “acute stress causes long-lasting changes in cholinergic gene expression, which is characterized by delayed symptoms including depression, irritability, and impaired cognitive performance” [R]. I experienced these. I’m not sure if others can feel which part of their brain is being affected, but I can tell when my hypothalamus is weak (feels weak whenever I eat lectins), how my prefrontal cortex is working, and sensations in general areas of my brain such as the hippocampus and brain stem. As I write this post, I decided to see if my intuition was correct as to the brain regions affected. Indeed, people with PTSD show smaller hippocampal volumes, increased amygdala function (touches hippocampus), and HPA dysregulation [R, R]. You shouldn’t try to change how you’re feeling, but you should be a passive observer and not get caught up in it. There’s no feeling that’s intrinsically bad. I find that feeling hurt has its own enjoyment when I just feel it in a passive way, instead of trying to change it or get swept up by it. You should also realize that any thoughts in this period are irrelevant because they are being completely influenced by your emotions and you are in a state of complete delusion. Instead of trying to think about what you should or shouldn’t do, just watch it all (your thoughts, emotions, etc.) as if you had no stake in the game. I recommend these simply by intuiting how these substances feel and how they interact with the affected regions. If you find yourself in an extremely stressful situation, taking these as a preventative is more helpful. I find that pot, LSD, and Astragalus “massage” different areas in the brain that are affected by acute stress. They all focus on different areas and using them all should help in unique ways. Pot “massages” the area of the brain that feels like the hippocampal area. It literally feels like this region is being massaged. Mushrooms are the most effective method for resetting my brain after a very stressful event. After a very stressful event, you can feel out of it for a couple of days. But after I took mushrooms, it felt as if I never was stressed. In my personal experience, LSD acts as a reset button, completely reforming the part of your brain that is affected by PTSD. It made me stop caring about everything for a month, and I was left wondering if my cognition would ever be the same. I wouldn’t take it again unless for a medicinal purpose – but I could see how LSD could be really helpful for some people. Astragalus is one of the only herbs that “massage” the affected areas as well as pot. It massages that brain area where the spine continues. The herb is so nontoxic and safe for your kidneys and liver that you can take a high dosage without worry. Want to learn about how your genes affect your neurotransmitters and best neurotransmitter-balancing remedies for you? Check out the mood DNA Wellness Report here. There are two areas in particular, the adrenal gland and nervous system issues, that I hadn’t figured out yet, so THANK YOU so much for that! Also… awesome list of causes. I thought it was interesting that in this piece, you didn’t really mention individuals who developed PTSD from having experienced sexual trauma or domestic violence, especially as children, but primarily just in general. Also, I would like to know exactly what you mean by “You should also realize that any thoughts in this period are irrelevant because they are being completely influenced by your emotions and you are in a state of complete delusion.” You didn’t articulate what you were referring to in regards to “this period.” I assume you mean the state in which one is experiencing “flashbacks,” because while it can be incredibly beneficial to step away from your traumatic memories and act as a passive observer, I think writing off the validity of thoughts occurring during that period to a “state of complete delusion” is reductive, as they can actually be useful. Forgive me if I misinterpreted your statement; I’m just curious.